Days after recreational marijuana became legal in Canada, our neighbors to the north may already be running out. Long lines and swamped websites greeted the first day of marijuana sales Wednesday. SDQC, which manages sales in Quebec, recorded more than 12,500 in-store transactions and 30,000 online orders the first day, “far exceeding” expectations. Within days, some products were posted as unavailable on the website. “Given the craze created by the legalization of cannabis and the scarcity of products across Canada, the SQDC expects significant short-term supply challenges for branches,” the company said. Halfway across the sprawling country in Manitoba, Manitoba Liquor and Lotteries warned that shortages for some products could last months. The Ontario Cannabis Store didn’t paint quite so glum a pot picture, warning that legalization has “resulted in a high volume of orders” but adding that deliveries should still be made within one to five business days. “We apologize for any inconvenience,” the statement said. Bill Blair, a Canadian legislator who led the legalization drive, told public broadcaster CBC that suppliers are struggling to meet roaring demand across the nation of 37 million people. “We expected certain strains might run out and there would be a bit of a run on supply,” he said. “But, you know, they’ve got a pretty good infrastructure in place and I’m confident it will work” in the long term. Canada is only the second country behind Uruguay and the first member of the Group of Seven nations to legalize, regulate and tax the sale of marijuana. The law allows adults – provinces determine the legal age – to possess up to 30 grams of pot, dried or equivalent in non-dried form. They can also share up to 30 grams with other adults and grow up to 4 plants per residence for personal use from licensed seeds or seedlings. The industry is already spurring additional business opportunities – a Girl Scout in Edmonton sold 30 boxes of cookies outside a pot store in 45 minutes. Supporters of legalization in the United States are hoping that success in Canada will help drive legalization in more U.S. states. 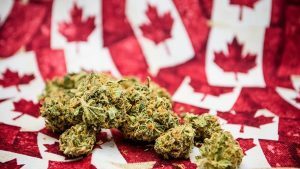 The U.S. Customs and Border Protection, however, has warned that its position on pot did not soften with Canada’s decision to legalize. “CBP officers are the nation’s first line of defense in preventing the illegal importation of narcotics, including marijuana,” the agency said in a statement. “U.S. federal law prohibits the importation of marijuana and CBP officers will continue to enforce that law.